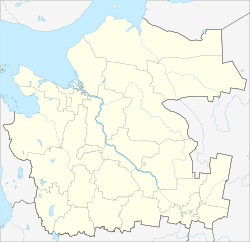 Koryazhma (Russian: Коря́жма) is a town in the southeast of Arkhangelsk Oblast, Russia, located on the left bank of the Vychegda River 30 kilometers (19 mi) east of Kotlas, at the confluence of the Bolshaya Koryazhemka River. Population: 39,641 (2010 Census); 42,811 (2002 Census); 41,795 (1989 Census). In 1535, the Koryazhemsky Nikolaevsky Monastery was founded in the mouth of the Bolshaya Koryazhemka (hence the name). After the 1917 October Revolution the monastery was abolished, and the territories which previously belonged to the monastery were used for agriculture. In 1953, the construction of a big paper mill started, and in 1954 first brickstone houses were built. In 1957, the settlement around the paper mill was officially designated as the urban-type settlement of Koryazhma. The paper mill started operation in 1961. In 1975, the population of Koryazhma was 42 thousands. August 15, 1985, Koryazhma obtained the town rights and became the town of oblast significance. Within the framework of administrative divisions, it is incorporated as the town of oblast significance of Koryazhma—an administrative unit with the status equal to that of the districts. As a municipal division, the town of oblast significance of Koryazhma is incorporated as Koryazhma Urban Okrug. Even though Koryazhma is not a part of Kotlassky District (by which it is geographically surrounded), it serves as the administrative center of Koryazhemsky Selsoviet, one of the twelve selsoviets into which that district is divided. Koryazhma is home of the Koryazhma Branch of the Ilim Group company, the largest chemical pulp and paper mills in Europe (previously Kotlas Pulp and Paper Mill). The Vychegda in Koryazhma is navigable, and in summer there is regular passenger navigation connecting Kotlas and Soyga (located approximately halfway between Koryazhma and Yarensk). There is a railway station (Nizovka) on the line connecting Kotlas and Vorkuta. Koryazhma is located on the road connecting Kotlas and Syktyvkar (via Shiroky Priluk). This portion of the road is paved. There is regular passenger bus traffic from Koryazhma to Kotlas, Veliky Ustyug, and Syktyvkar. The only collection of historical buildings in Koryazhma is in the Koryazhemsky Nikolaevsky Monastery. The Church of the Holy Mandylion originates from 1746 and is one of the oldest stone churches in Arkhangelsk Oblast, and the Church of Saint Longin of Koryazhma, consecrated to the founder of the monastery, was built between 1907 and 1912. There is also the House of the Hegumen which forms a single ensemble with the Church of Saint Longin of Koryazhma. All these buildings are protected as cultural heritage of local importance. The Annunciation Cathedral, the oldest stone building of the monastery (1665), and the bell-tower, were demolished in 1933. The local association football team is FC Khimik Koryazhma. There is also a bandy team, Vychegda. ^ a b Государственный комитет Российской Федерации по статистике. Комитет Российской Федерации по стандартизации, метрологии и сертификации. №ОК 019-95 1 января 1997 г. «Общероссийский классификатор объектов административно-территориального деления. Код 11 408 000», в ред. изменения №278/2015 от 1 января 2016 г.. (State Statistics Committee of the Russian Federation. Committee of the Russian Federation on Standardization, Metrology, and Certification. #OK 019-95 January 1, 1997 Russian Classification of Objects of Administrative Division (OKATO). Code 11 408 000, as amended by the Amendment #278/2015 of January 1, 2016. ). ^ "List of postal codes" (in Russian). Russian Post. Retrieved July 23, 2011. ^ ИЗ ИСТОРИИ КОРЯЖМЫ (in Russian). Коряжма. Официальный сайт администрации города. Retrieved June 7, 2011. ^ История Храма (in Russian). Коряжма Онлайн. Retrieved June 8, 2011. ^ «Вычегда» Коряжма, Архангельская обл. (in Russian). Russian Bandy Federation. Retrieved February 9, 2015. "Официальный сайт администрации города Коряжма / Official website of the town administration" (in Russian). Retrieved June 7, 2011. This page was last edited on 26 April 2018, at 15:58 (UTC).